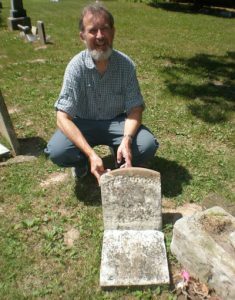 Sally’s descendant, Mike Brown, near her headstone. Sarah (called “Sally”) was born to Joshua and Sarah Clyburn in about 1785, according to the 1850 census, and thus she was about three years older than her brother Ephraim. [1850 United States Census, District 10, Jefferson County, Illinois, accessed through Ancestry.com. See also Verner M. Claybourn and Harriette Pinnell Threlkeld, Supplement to the Claybourn Family (Threlkeld, 1979).] In that same census she gave South Carolina as her place of birth, but her daughter Jane said in the 1880 census that her mother was born in North Carolina and her father in Ireland. [1880 United States Census, Rome, Jefferson County, Illinois, accessed through Ancestry.com.] Given that the present Carolina border was not set until 1815, the discrepancy can be explained. Sally married a man named James Brown. A professional genealogist hired by Lucille Brown McClure, a descendant of James and Sally, to trace James Brown came to the conclusion that he was much older than Sally. Their marriage must have taken place near the time of Sally’s father’s death about 1799. I, James Brown of the county of Smith and State of Tennessee, being very sick and weak in body, but of perfect mind and memory, thanks be given to God; calling unto mind the mortality of my body, and knowing that it is appointed for all men once to die, do make and ordain this my last will and testament; that is to say, principally and first of all, I give and recommend my soul into the hand of Almighty God, that give it, and my body I recommend to the earth, to be buried in a decent Christian burial, at the discretion of my executors: nothing doubting but at the General Resurrection, I shall receive the same again, by the mighty power of God, and as touching such worldly estate wherewith it has pleased God to bless me in this life, I give demise, and dispose of the same in following manner and form. I give and bequest unto my two sons Joshua and William Brown seventy-five acres of land each, laying in Smith County, State of Tennessee, upon the waters of Smiths fork the place where I now live. Also I give and bequest unto the child that my wife is now a going with [sic], eighty three acres and ninety six square poles of the same tract of land that I now live on, provided it be a son, if it be a girl child for it to be sold and equally divided among my daughters. Also I give and bequeath unto my beloved wife Sally Brown all the profits arising from all my land for the support of her self and my children until they all come of age provided she does not make waste of the property. But if she does make waste of the property then for Nathaniel Ferries and John Allen to take it from her and put it to the best use they can for the support of the children until they come of age. But if my wife gets married then for her to have one third of the land and moveable property during her life and then for it to go to the children. All my moveable property to be sold to pay all lawful demands that may come against the estate and for the care of my family. I appoint Nathaniel Farrier and John Allen whole and sole executors. In this last will and testament, I do hereby declare and confirm this to be my last will and testament in witness whereof I have set my hand and seal this the 22nd day of December in the year of our Lord one thousand eight hundred and twelve signed, sealed, published and delivered. Declared by the said same Brown to be his last will and testament in the presence of us who at his request and in the presents of each other subscribe our witness hereto. In the 1820 census for Smith County, Sally Brown is the family head of household consisting of one male age 10-15 (William), one male age 16-25 (Joshua), one female under age 10 (Jane), two females age 10-15 (Martha and Sarah), one female age 16-25 (Nancy), and one female age 26-44 (Sally). By the 1830 census, the family had moved to Jefferson County, Illinois, and in 1850 Sally was sixty-five years old and living there with her daughter Jane. Sally Brown is buried in Antioch Cemetery in Jefferson County. [Much of the information on Sally comes from Patricia Brown, who married a descendant of James and Sally, in correspondence between her and CGS in 2013.] Her headstone (now broken in two) says she died in 1853 at age seventy-three. Other Brown family members are buried with Sally, including her son Joshua and his family. Joshua Brown was born on 5 April 1801 in South Carolina. [1850 United States Census, District 10, Jefferson County, Illinois, accessed through Ancestry.com.] In about 1823, probably in Tennessee, he married Elizabeth E. Dale (born on 23 February 1807 in DeKalb County, Tennessee). Joshua died on 29 September 1858 and Elizabeth followed on 3 February 1868, both in Jefferson County, Illinois. They had ten children, listed below. Nancy P. Brown was born on 27 May 1825 in DeKalb County, Tennessee. She married on 20 March 1844, in Jefferson County, Illinois, to Joseph Harmon (born March 1822 in Maury County, Tennessee). They had eight children. Nancy died on 13 February 1905 and Joseph followed in 1910. Both are buried in Antioch Cemetery. James Edward Brown was born on 23 March 1827 in Rutherford County, Tennessee. On 27 April 1848 in Jefferson County, Illinois, he married (1st) Hannah Donoho. Hannah was born in about 1828 in Ohio and died about 1856 in Jefferson County, Illinois. They had four children. On 19 February 1857 in Jefferson County he married (2nd) Mary E. Vance (born on 2 June 1833 in Tennessee). They had four children. James died on 7 June 1891 and Mary died many years later on 2 March 1922, both in Jefferson County. James and Mary are buried in Williams Cemetery in Jefferson County. 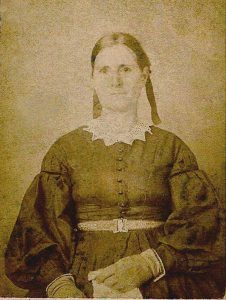 Sarah C. Brown was born on 10 February 1830 in Jefferson County, Illinois, and died on 26 January 1851 in Jefferson County. She is buried in Antioch Cemetery. William D. Brown was born on 25 February 1832 in Jefferson County, Illinois, and died on 19 November 1851 in Jefferson County. He is buried in Antioch Cemetery. Mary “Polly” Brown was born about 1834 in Jefferson County, Illinois. She died after the 1850 census, date unknown. John J. Brown was born on 3 August 1835 in Jefferson County, Illinois. On 31 August 1864 in Moultrie County, Illinois, he married Martha Catherine Smysor Warren. Martha was born in November 1835 in Shelby County, Illinois and had previously married John H.B.E. Warren on 25 December 1851 in Moultrie County. John Brown died on 18 June 1871 in Moultrie County, where he is buried in Smyser Cemetery. Martha died in 1903, probably in Coles County, Illinois. 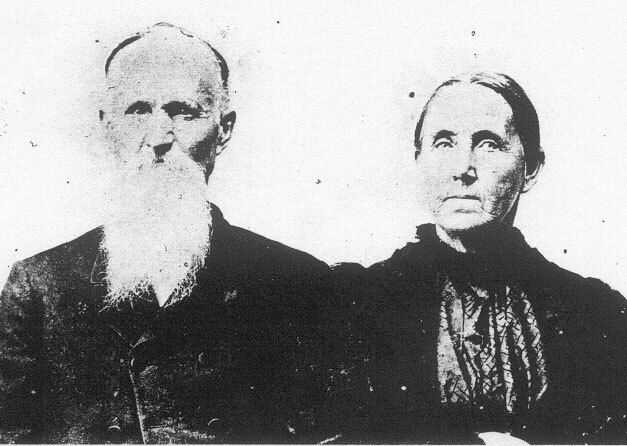 John and Martha had two sons together. Emily Melvina Brown was born on 6 November 1837 in Jefferson County, Illinois. She married (1st) James Allman Hester on 20 October 1859 in Jefferson County, Illinois as his third wife. [James Hester was born 18 February 1817 in Granville County, North Carolina, and died on 13 July 1867.] They had three children. She married (2nd) Michael Free on 27 September 1868 in Jefferson County and divorced him in March 1872. She married (3rd) Josiah Scott Torrence on 25 December 1873 in Christian County, Illinois. [Josiah Torrence was born on 21 January 1831 in North Carolina or Illinois, and died on 7 March 1917 in Wayne County, Indiana.] Emily and Josiah had four children. Emily died on 4 May 1883 in Christian County and is buried in Oak Hill Cemetery there. Martha J. “Patsy” Brown was born in about 1841 in Jefferson County and died after the 1860 census, date unknown. Eliza A. Brown was born in about 1843 in Jefferson County, Illinois. She married Fountain George Brown on 23 November 1861 in Jefferson County. Fountain was born on 9 August 1833 in Jefferson County, a son of Joseph D. Z. Brown (1799-1867), who may have been a related to her grandfather. Both Eliza and Fountain died after 1861 and it is possible he perished in the Civil War. Elizabeth Eva Brown was born on 19 July 1845 in Jefferson County, Illinois. She married (1st) John Weber on 1 May 1862 in Macon County, Illinois. John Weber was born in about 1825 in Germany and died about 1884 in Moultrie County, Illinois. They had seven children. She married (2nd) John Mahon on 31 July 1885 in Moultrie County, Illinois. John Mahon was born 3 January 1828 in Kentucky and died 31 August 1909 in Moultrie County. Elizabeth died on 8 August 1916 in Moultrie County. She and John Mahon are buried in Marrowbone Township Cemetery in Moultrie County, Illinois. Nancy Brown was born on August 1804 in Sumner County, Tennessee. She married Hezekiah Balch Newby on 11 December 1823, probably in Tennessee. Hezekiah was born on 9 January 1803 in Wilson County, Tennessee. They had at least eight children and several of them and their children were afflicted with consumption (tuberculosis) and died young from the disease. Hezekiah died on 5 August 1872 and Nancy followed on 4 April 1877 in Jefferson Co, Illinois. They are buried in the old part of Old Union Cemetery in Jefferson County, Illinois. James Newby was born on 26 August 1825, probably in Tennessee, and died on 14 February 1846 in Jefferson County, Illinois. He did not marry. He is buried in Old Union Cemetery in Jefferson County. Elizabeth Eveline Newby was born on 1 April 1830 in Jefferson County, Illinois. She married John Wilbanks on 9 December 1849 in Jefferson County. [John Wilbanks was born on 12 October 1820 in St. Clair County, Illinois, to Joseph Wilbanks and Candace Pickering. They were married on 14 October 1819 and their children were John, Luke, Quincy Adams Sr., and Margaret. Daniel Wilbanks, father of Joseph, was married to Jane Thomas in South Carolina. They emigrated to Illinois. The Thomas family (father John, son John Jr., and daughter Jane Black Thomas) are all listed as patriots of the Revolutionary War.] John raised his first crop after becoming of age on public land in Elk Prairie, Illinois, in 1843. By energy and good management he built up his farm of over 400 acres. He served in the Mexican War, enlisting in June 1846 in the Third Regiment, serving for one year. In 1848, he was elected Circuit Clerk of Jefferson County and in 1852 he was elected to the State Legislature. In 1873, he began a banking business with G.W. Evans. Elizabeth and John had eight children. John died on 25 December 1889 and Elizabeth followed on 10 May 1890. They are buried in South Hickory Hills Cemetery in Jefferson County. Nathan Green Newby was born on 3 May 1833 in Jefferson County, Illinois, and died on 11 August 1871. He did not marry. He is buried in Old Union Cemetery in Jefferson County. Angeline P. Newby was born on 10 July 1835 in Jefferson County, Illinois. On November 1851 she married Samuel George Gibson (born on 23 October 1827 in Monroe County, Ohio). They had ten children. Angeline died on 7 December 1895 and Samuel died on 22 October 1914. They are buried in Oakwood Cemetery in Jefferson County. Asberry Newby was born on 19 December 1837 in Jefferson County, Illinois. On 1 July 1862 he married Luphemia W. Adams (born on 16 August 1835 in Jefferson County). They had five children. Luphemia died on 16 March 1879 and Asberry died on 18 September 1903. They are buried in Old Union Cemetery in Jefferson County. Barney Newby was born on 24 June 1839 in Jefferson County, Illinois. On 22 June 1862 he married Martha A. Summers (born on 23 August 1839 in Jefferson County). They had one child. Barney died on 17 December 1865 and is buried in Old Union Cemetery in Jefferson County. His widow Martha married again in 1872 as the fourth wife of Hugh Miller McNew (1818-1897) and had two more children. [Martha’s son Otto Homer McNew (1872-1955) married Clara Bell Farlow (1873-1956), who is the sister of Walter Farlow (1881-1951), whose oldest daughter Grace Jetty Farlow (1908-1986) married Miles Newton Brown (1905-1976).] Martha died on 13 February 1878 and she and Hugh are buried in Arnold Cemetery in Jefferson County. Candace Newby was born in March 1842 in Jefferson County, Illinois. On 19 February 1861 she married Asa Hawkins (born on 6 January 1834). They had three children. Asa served in the Civil War as an officer in Company I of the 60th Illinois Volunteer Infantry from July 1862 to January 1865. Candace died on 4 February 1872 in Jefferson County and is buried in Old Union Cemetery in Jefferson County. Asa died on 9 June 1905 in the Old Soldiers’ Home in Quincy, Adams County, Illinois. He is buried there in Sunset Cemetery. Ellen Raum Newby was born on 28 September 1845 in Jefferson County, Illinois. On 19 November 1874 she married Alonzo Jones (born on 24 December 1842 in Jennings County, Indiana). Ellen died in 1917 and Alonzo died on 23 June 1918 in Fayette County, Illinois. They had four children. They are buried in Opdyke Cemetery in Jefferson County. Martha Brown was born in about 1806 in Tennessee. She married Benjamin Patterson in about 1825, probably in Tennessee. Benjamin was born in about 1805 in North Carolina. They had nine children. Martha died died of pneumonia in October 1859 in Wayne County, Illinois, and Ben died sometime after 1860. Their places of burial are not known. M. M. Patterson (male) was born in about 1827 in Tennessee and died after the 1850 census. Robert W. Patterson was born on 17 April 1830 in Jefferson County, Illinois. In about 1852 he married Lina Mandrell (born on 28 December 1835 in Tennessee). Robert died on 11 February 1861 in Wayne County, Illinois, and Lina died on 24 March 1908, probably in Ripley Co, Missouri. They had three children. Their places of burial are not known. S. A. Patterson (female) was born in about 1832 in Illinois and died after the 1850 census. Sarah Patterson was born in about 1834 in Illinois and died after the 1850 census. E. A. Patterson (female) was born in about 1837 in Illinois and died after the 1850 census. J. A. Patterson (male) was born in about 1840 in Wayne County, Illinois, and died after the 1850 census. Frances J. Patterson (female) was born in about 1843 in Wayne County, Illinois, and died after the 1860 census. Martha G. Patterson was born in about 1846 in Wayne County, Illinois, and died after the 1860 census. Nancy K. Patterson was born in 1850 in Wayne County, Illinois, and died after the 1860 census. William Josiah Brown was born on 1 May 1808 in Smith County, Tennessee. In about 1830 he married Elizabeth F. McMeen (born on 11 February 1815 in Smith County). They had nine children. William died on 12 November 1865 and Elizabeth died on 15 March 1897, both in Jefferson County, Illinois. They are buried in Pleasant Grove Cemetery in Jefferson County. James A. Brown was born on 14 February 1832 in Jefferson County, Illinois. On 29 March 1855 he married (1st) Harriet N. Dement (born on 22 February 1839 in Marion County, Illinois). They had five children together before Harriet died in 1864 in Jefferson County. Her place of burial is not known. Soon after Harriet’s death James married (2nd) Susan Piety Hutchison on 27 December 1864 in Jefferson County. She was born on 2 July 1836 in Wilson County, Tennessee, and was previously married to Andrew Jackson Summers with whom she had three children. James and Susan had six children. James died on 28 January 1901 and Harriet died 20 June 1919 in Jefferson County. They are buried in the Union Chapel Cemetery in Jefferson County. Mary Mahala Brown was born on 18 August 1834 in Jefferson County, Illinois. On 7 March 1861 she married (1st) John Alexander Warren. John was born in about 1830 in Williamson County, Tennessee, and died not long after the 1880 census in Jefferson County. His death date and burial place are not known. Mary and John had five children together. Mary married (2nd) Benjamin William Greenberry Elkins on 18 August 1901 in Jefferson County as his third wife. They had no children. Benjamin was born on 6 June 1827 in Bedford County, Tennessee and died on 9 March 1918 in Jefferson County. He is buried in Jordan Chapel Cemetery in Jefferson County, as are his two previous wives. Mary died on 7 September 1924 and is buried in Pleasant Hill Cemetery in Jefferson County. Nancy Jane Brown was born on 13 April 1837 in Jefferson County, Illinois. She married Reuben Padget on 22 February 1864 as his second wife. He was born on 5 April 1834 in Overton County, Tennessee, and died Mar 15, 1921 in Jefferson County. They had six children. Nancy died on 30 January 1920. They are buried in Pleasant Hill Cemetery in Jefferson County. Joseph Newton Brown was born on 5 March 1841 in Jefferson County, Illinois. On 18 May 1865 he married Sarah Catherine Gaskins (born on 18 October 1840 in Clark County, Indiana). They had four children. Joseph died on 11 February 1901 and Sarah died on 13 March 1928. They are buried in Ebenezer Cemetery in Jefferson County. Joshua Brown was born on 2 September 1844 in Jefferson County, Illinois. He did not marry and died on 30 March 1865. He is buried in Pleasant Grove Cemetery in Jefferson County. Sarah Martha Brown was born in about 1847 in Jefferson County, Illinois. On 9 October 1868 she married John Canon Mullinax (born in about 1844 in Wilson County, Tennessee). They had two children. Sarah died in about 1878 in Jefferson County. Her death date and place of burial are not known. Her widower married again in Jefferson County in late 1879 and moved to Texas before 1900 with his new wife and the children of both of his marriages. John died on 21 May 1913 in San Jacinto County, Texas. He is buried in Evergreen Cemetery in San Jacinto County. William T. Brown was born on 25 August 1853 in Jefferson County, Illinois. He did not marry and died on 4 October 1927. He is buried in Pleasant Grove Cemetery in Jefferson County. Selah Elizabeth Brown was born on 13 January 1855 in Jefferson County, Illinois and died on 22 March 1857. She is buried in Pleasant Grove Cemetery in Jefferson County. John Jefferson Brown was born on 2 December 1856 in Jefferson County, Illinois. On 12 January 1877 he married (1st) Martha Carpenter (born on 5 May 1856 in Jefferson County). They had one son who died as an infant. Martha died on 5 May 1879 and is buried in Pleasant Grove Cemetery in Jefferson County. On 20 September 1880 John married (2nd) Carrie F. Day (born on 18 January 1862 in Sullivan County, Indiana). They had no living children. Carrie died on 20 March 1882 and is buried in Pleasant Grove Cemetery in Jefferson County. He married a third time, on 18 January 1884, to Mariah E. Dodson (born on 13 January 1864 in Jefferson County). They had no living children. John died on 31 October 1928. Mariah died on 23 August 1933 in Union County, Illinois. They are buried together in Pleasant Grove Cemetery. Sarah Brown was born on 30 April 1810 in Smith County, Tennessee. She married (1st) Joab Patterson in about 1830 as his second wife. He was born in about 1790 in North Carolina. Sarah and Joab had two children. Joab died in 1839 in Jefferson County, Illinois, and is buried in an unmarked grave in Antioch Cemetery. On 22 December 1839 Sarah married (2nd) William B. Hendrickson, his second wife (William was born on 11 October 1807 in North Carolina). They had three children. Sarah died in November 1862 and William followed on 14 September 1863, both at the height of the American Civil War. Their death occurred in White County, Arkanas, an area hit hard by the travesties of the conflict and also the home county of Sarah’s distant cousin John H. Claiborne. They are buried in Mount Vernon Cemetery in Faulkner County, Arkansas, which is close to where they lived in White County, Arkansas, as of the 1860 census. Green Berry Patterson was born in about 1834 in Jefferson County, Illinois, and died after the 1850 census, where he was counted in Dallas County, Missouri. Martha Patterson was born in about 1836 in Jefferson County, Illinois, and died after the 1850 census, where she was counted in Dallas County, Missouri. Jesse Clement Hendrickson was born on 18 October 1844 in Jefferson County, Illinois. In about 1867 he married (1st) on 19 September 1867 in White County, Arkansas, to Sarah Elizabeth Collingsworth (born on 2 September 1844 in Alabama). They had three children together. Sarah died on 23 July 1883 in Coryell County, Texas, and is buried in Sadler Cemetery in Coryell County. On 24 January 1884, in White County, Arkansas, Jesse married (2nd) Crissa A. Hill (born on 18 August 1849 in Kentucky). Jesse and Crissa had three children together. Crissa died on 5 November 1914 in Faulkner County, Arkansas. The following spring, on 15 April 1915, Jesse married (3rd) Cornelia Ann Alexander (born on 13 October 1847) in Marshall County, Alabama. Cornelia was previously married in 1868 to James Thomas Harper, who died on 23 December 1936 in Faulkner County. [Cornelia is buried with her first husband in Marcus Hill Cemetery in Faulkner County, Arkansas.] She had eight children with her first husband and none with her second. Jesse died on 11 June 1934 in Faulkner County and is buried there with his second wife Crissa in Old Liberty Cemetery. John Dallas Hendrickson was born in about 1847 in Dallas County, Missouri. On 3 December 1866 John married Mary Elizabeth Belew in White County, Arkansas (born 15 October 1849 in Morgan County, Alabama). They had six children, three of whom died young. Mary died on 27 March 1920 in Pulaski County, Arkansas, though her grave site is not known. John died after the 1820 census in White County and is buried in Romance Cemetery there. Sarah “Sally” Hendrickson was born in about 1850 in Arkansas and died after the 1860 census, where she was counted in White County, Arkansas. Jane Brown was born on 11 April 1813 in Smith County, Tennessee. On 13 February 1834 she married in Jefferson County, Illinois, to Marquis DeLafayette “Marcus” Bruce (born on 19 March 1812 in Wilson County, Tennessee). They had ten children. Marcus died on 6 April 1887 and Jane followed soon after on 26 July 1887 in Jefferson County. They are buried there in Antioch Cemetery. Francis Marion Bruce was born on 10 February 1836 in Jefferson County, Illinois. On 21 December 1854 he married Rachel Fields (born on 22 July 1834 in Jefferson County). They had four children. Francis died in April 1862 at Shiloh, Tennessee, while serving as a medical helper to Confederate troops. His burial place is not known. Rachel died on 13 April 1920 in Marion County, Illinois. She is buried there in Elmwood Cemetery. Charlotte Mary Bruce was born on 17 January 1837 in Jefferson County, Illinois. On 2 October 1851 she married John Lafayette Maxfield (born on 26 January 1832 in Sangamon County, Illinois). Together they had twelve children. John died on 11 May 1911 and Charlotte died on 12 February 1921, both in Fayette County, Illinois. They are buried there in Farina Cemetery. 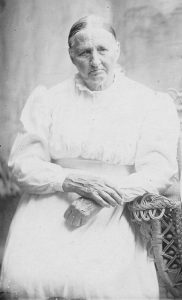 Martha Ann Bruce was born on 9 November 1838 in Jefferson County, Illinois. On 14 January 1864 she married Zadok Casey Galbraith (born in April 1836 in Jefferson County). They had eight children together. Martha died on 23 August 1884 and Zadok died on 25 October 1906, both in Jefferson County. They are buried there in Pleasant Grove Cemetery. Sarah “Sally” Bruce was born on 19 December 1840 in Jefferson County, Illinois. On 31 March 1859 she married John D. Massey (born in about 1835 in Tennessee). Together they had three children. Sally died on 25 September 1865 in Marion County, Illinois, where she is buried in Burge Cemetery. John died between 1893 and 1910, probably in Collins County, Texas. His death date and place of burial are not known. Nancy Malissa Bruce was born in May of 1844 in Jefferson County, Illinois. On 1 January 1861 she married William B. Haworth (born 24 January 1837 in Parke County, Indiana). They had ten children, with five dying young. William died on 15 April 1889 and is buried in Jordan Chapel Cemetery in Jefferson County. Nancy died between 1911 and 1915, probably in Marion County, Illinois. Her death date and burial place are not known. James Dallas Bruce was born on 15 February 1846 in Jefferson County, Illinois. On 27 November 1870 he married Hellen M. Draper (born in about 1850 in Illinois). They had five children. James died on 29 September 1900 in Marion County, Illinois and is buried there in Evergreen Cemetery. Hellen died after being counted in the 1920 census in Shelby County, Illinois, but the precise date is unknown. Mary A. Bruce was born in about 1848 in Jefferson County, Illinois, and died on 28 February 1861. She is buried in Jordan Chapel Cemetery in Jefferson County. Samantha Jane Bruce was born on 30 July 1850 in Jefferson County, Illinois, and died on 28 October 1862. She is buried in Jordan Chapel Cemetery in Jefferson County. Rebecca Alice Bruce was born on 5 December 1853 in Jefferson County, Illinois. On 1 May 1873 she married Joseph Hawkins (born Jun 1, 1850 in Indiana). They had eleven children. Joseph died on 21 February 1919 and Rebecca died on 25 October 1935, both in Marion County, Illinois. They are buried in Antioch Cemetery in Jefferson County. Azariah Bruce was born in about 1856 in Jefferson County, Illinois. On 4 January 1887 he married Laura May Davis (born 1 November 1865 in Jefferson County). They had one daughter, then divorced in 1891 in Jefferson County. Azariah was a medical doctor. He died between 1891-1921, though the date of his death and place of burial are not known. Laura married again in 1894 and raised their daughter with her second husband and their children. Laura died on 20 November 1935 in Marion County, Illinois and is buried there in Hillcrest Cemetery.